The story is well known now. In 2003 a terrible, terrible movie called The Room was released. Tommy Wiseau, the film’s financier, producer, director, writer and star, asserted that it had cost him $US6 million. In its two week run the drama took less than $US2,000. After publication of the book The Disaster Artist, about the making of The Room, the film was re-released under the banner, ‘The Citizen Kane of bad movies’ and became a cult hit. Tommy Wiseau is played by James Franco – and although Franco is much larger, younger and more attractive than his character, he does a good line in what seems to have been Wiseau’s spaced-out, enigmatic repulsiveness. His brother, Dave Franco, portrays Wiseau’s friend, Greg Sestero (the author of The Disaster Artist). Wiseau and Sestero meet at a San Francisco acting class, and Greg is (inexplicably) impressed by Wiseau’s over-the-top rendition of a famous Brando scene. Wiseau, claiming to be a 19-year old from New Orleans, appears decades older and has a most peculiar manner of speech, exemplified by a possibly Polish [or Croatian? – Ed] accent, complete disregard for English articles (‘a, ‘an’, ‘the’) and the cadences of a person who has suffered a brain injury. Tommy says that he was badly injured in an accident, and we wonder if compensation payments are the source of his wealth. Or an inheritance? He has certainly not earned the money and he doesn’t seem the type who would live long as a drug lord. Tommy is unpleasant, jealous and unpredictable, so naturally Greg sets off with him to Hollywood, where they both expect to be Brad-Pitting-it within days. When weeks turn into months, they embark on the making of The Room. At this point The Disaster Artist takes off; the first part, establishing the relationship between the friends, being too long. The Disaster Artist is a movie of the making of a movie, and at times it is a movie of the making of a movie of the making of a movie, given Wiseau’s practice of recording his crew without their knowledge. The shooting of scenes needing more than 60 takes, the inane script, the heat, the bizarre behaviour of the director/producer/writer/star all make for a nightmare shoot. Seth Rogan is particularly good as the professional and patient script supervisor who tries to keep it all together. There are cameos by Jackie Weaver, Sharon Stone, Melanie Griffith, Bryan Cranston and Bob Odenkirk; Zac Efron is a surprising stand-out as an actor playing a truly frightening thug. 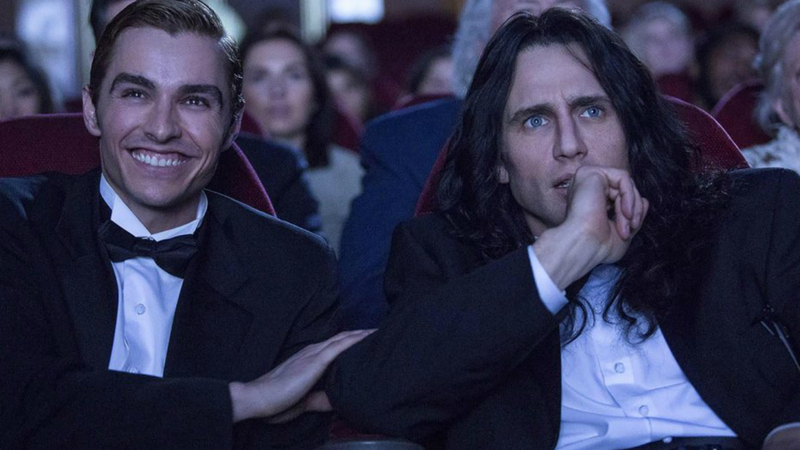 The denouement of The Disaster Artist – the black-tie premiere of The Room, is the only false note (other than the rather bad wigs and facial hair). The cast and crew are horrified and bewildered by the final product – a mishmash of appalling acting, jump cuts, inexplicable conversations and dislocation. But it is simply not credible that people who worked on this disaster would not have foreseen how awful it would be. The audience’s hysterical reaction is over done. But seeing scenes which we have witnessed being filmed, in all their cringe-worthiness, is splendidly funny. In a clever, amusing and strangely satisfying ending, scenes from the ‘real’ The Room are shown on a split screen side-by-side with their re-enactments from The Disaster Artist. It is marvellous to see the ‘real’ thing and realise that it is in fact that bad. Tommy Wiseau made me think of Arnold Friend in ‘Where Are You Going, Where Have You Been?’ by Joyce Carol Oates. Creepy guy pretending to be a teenager, dyed hair or a wig, weedy and creepy as hell.